Here, we report a type strain AST-10 representing a novel species Sulfurimonas hongkongensis within Epsilonproteobacteria, which is involved in marine sedimentary sulfur oxidation and denitrification. Strain AST-10T (= DSM 22096T = JCM 18418T) was isolated from the coastal sediment at the Kai Tak Approach Channel connected to Victoria Harbour in Hong Kong. It grew chemolithoautotrophically using thiosulfate, sulfide or hydrogen as the sole electron donor and nitrate as the electron acceptor under anoxic conditions. It was rod-shaped and grew at 15–35°C (optimum at 30°C), pH 6.5–8.5 (optimum at 7.0–7.5), and 10–60 g L−1 NaCl (optimum at 30 g L−1). Genome sequencing and annotation of strain AST-10T showed a 2,302,023 bp genome size, with 34.9% GC content, 2,290 protein-coding genes, and 42 RNA genes, including 3 rRNA genes. The genus Sulfurimonas was formally proposed in 2003, and included only one species, Sulfurimonas autotrophica OK10T, at that time . Since then, several novel species have been identified, such as Sulfurimonas paralvinellae GO25T , Sulfurimonas denitrificans DSM 1251T (reclassified, previously known as Thiomicrospira denitrificans) , and Sulfurimonas gotlandica GD1T . Here, we report another novel species, Sulfurimonas hongkongensis AST-10T, isolated from coastal sediment, and describe its features, together with the genome sequencing and annotation. Currently, all known Sulfurimonas members were isolated from marine sediments except for strain GD1 from deep seawater . The most widely shared feature of Sulfurimonas members is chemolithoautotrophy; strains can grow by oxidizing hydrogen gas, elemental sulfur, hydrogen sulfide, or thiosulfate [1–7]. In our previous studies, anoxic sulfur-oxidizing bacteria were demonstrated to dominate the nitrate induced marine sediment remediation process [8–10]. 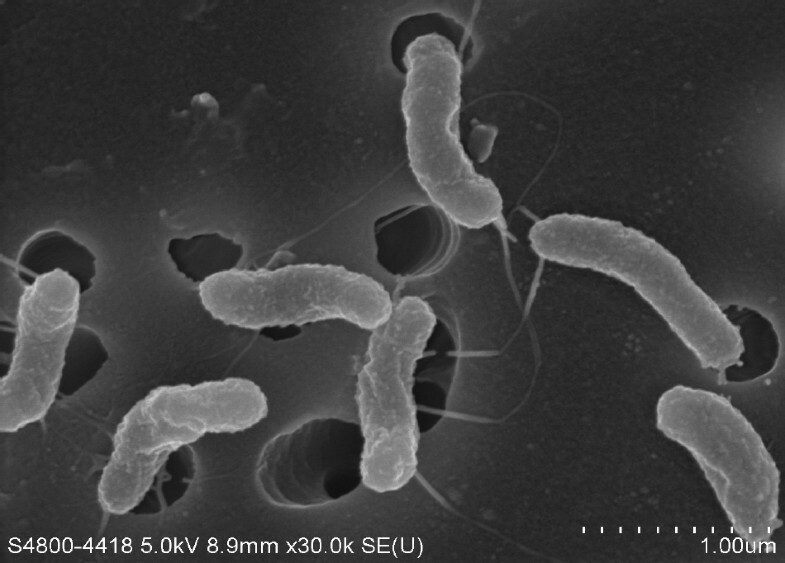 Phylogenetic analysis based on 16S rRNA genes showed that Epsilonproteobacteria closely related to S. denitrificans constituted the major bacterial population during such remediation of the sediment at Kai Tak Approach Channel, Hong Kong, China. Strain AST-10T was isolated from the sediment and named Sulfurimonas hongkongensis sp. nov., based on its unique physiological and phylogenetic characteristics. Sediment was collected 10–50 cm below the seawater/sediment interface at the Kai Tak Approach Channel connected to Victoria Harbor in Hong Kong, China. Sewage and industrial effluent had been discharged there for decades until the installation of a new sewage collection system in the late 1990s. The long lasting sulfate-reducing conditions resulted in a high sulfide concentration in the sediment, where an AVS (Acid-Volatile Sulfide) of 198 µmol g−1 had been measured . The pore water after centrifugation at 4,000 rpm for 15 min had a pH of 7.89 and a salinity of 2.9%. Enrichments were prepared by adding 20 g of wet sediment (32.0% dry matter) to serum bottles containing 70 mL of sterilized seawater, purged with N2 and incubated for at least 24 h at room temperature. Potassium nitrate (1 g L−1) and sodium phosphate, monobasic (0.1 mmol L−1), were then added from sterilized stock solutions. The bottles were incubated at 28°C in a water bath for 72 h. The enrichments were plated onto agar plates of DSM113-S medium, a salinity modified version of DM113 medium that is recommended by DSMZ for nitrate-reducing and sulfide-oxidizing bacteria. One liter of DSM113-S contained: KH2PO4 (2.0 g), KNO3 (4.0 g), NH4Cl (1.0 g), MgSO4·7H2O (0.8 g), Na2S2O3·5H2O (5.0 g), NaHCO3 (1.0 g), FeSO4·7H2O (2.0 mg), NaCl (25.0 g) and 2 ml of trace element solution SL-4. Solid media contained 1.5% bacterial agar from Difco. All media were sterilized by autoclaving and cooled under N2 atmosphere. Colonies formed on plates were picked and further purified by re-streaking single colonies on agar plates for more than 20 rounds (4–10 d round−1). A colony isolated and purified from the above process was defined as strain AST-10T. The 16S phylogenetic tree shown in Figure 1 indicated that strain AST-1T is a member of the genus Sulfurimonas, (Table 1). An online BLAST query in NCBI using the 16S rRNA gene sequence from strain AST-1T showed a relatively low identity to all currently identified Sulfurimonas species, including S. denitrificans DSM 1251T (97% identity), S. gotlandica GD1T (95% identity), S. autotrophica OK10T (95% identity), and S. paralvinellae GO25T (94% identity). Using the commonly accepted criterion of a 97% 16S rDNA sequence similarity cut-off for defining species [19,20], strain AST-10T could accordingly be identified as a novel species within the genus Sulfurimonas. Phylogenetic tree highlighting the position of Sulfurimonas hongkongensis relative to the other species within the Helicobacteriaceae. The neighbor-joining tree was constructed using MEGA 5.05 and tested with 1,000 bootstrap replicates. Bootstrap values over 50% are shown and the scale bar 0.02 represents 2% nucleotide substitution. All reference sequences can be exactly searched and retrieved from NCBI GenBank based on the full name of each strain. Cell morphology was examined by Scanning Electron Microscopy (SEM). As shown in Figure 2, the cells of AST-10T were rod-shaped, 0.2–0.4 µm in diameter, and 0.5–1.2 µm in length. On solid medium, AST-10T grew and formed small, white, transparent, round shaped colonies with smooth boundaries. Scanning electron micrograph of Sulfurimonas hongkongensis AST-10T. The scale bar represents 1.0 µm. Effects of temperature, pH, and salinity on the growth of strain AST-10T were investigated, showing that it grew at 15–35°C (optimum at 30°C), pH 6.5–8.5 (optimum at 7.0–7.5), and 10–60 g L−1 NaCl (optimum at 30 g L−1). The generation time of strain AST-10T under optimal conditions was tested as 6.1 h. It was significantly shorter than other species, such as S. paralvinellae GO25T and S. denitrificans DSM 1251T. The cell yield of strain AST-10T was 5.2 g dry weight per mole of S2O32−. This value is similar to that of its Epsilonproteobacterial relative S. denitrificans DSM 1251T (5.72 g), but only about one-half of the Betaproteobacterial Thiobacillus denitrificans (11.6 g). Such difference in growth efficiency might be attributed to the different pathways used for carbon fixation and metabolism. To determine whether electron acceptors other than NO3− would sustain the growth of strain AST-10T, SO42−, NO2−, Fe3+, and O2 were separately tested with S2O32− as the sole electron donor. No growth was observed using any of these electron acceptors. S2O32−, HS−, and H2 can support the growth of strain AST-10T as electron donors, however, acetate, lactate, malate, formate, pyruvate, glucose, glycerol, and yeast extract cannot. Hence, strain AST-10T was a chemolithoautotroph, using NO3− as an electron acceptor and S2O32−, HS−, or H2 as an electron donor. The time course of S2O32− oxidation and NO3− reduction during strain AST-10T growth was monitored. N2 was the dominant denitrification product, no accumulation of N2O and NO2− was detected, when it was cultivated using DSM113-S at 30°C and pH 7.5. Significant production of insoluble S0 occurred when it was cultured with an excess amount of S2O32− (molar ratio of S2O32−/NO3− > 2). SO42− became the dominant oxidation product under excess NO3− conditions (molar ratio of S2O32−/NO3− < 0.25). This was quite similar to the well-characterized strain Thiomicrospira CVO . But for S. denitrificans DSM 1251T, no accumulation of insoluble S0 was observed even under a high molar ratio of S2O32−/NO3− . Cellular fatty acid composition was analyzed using the cells grown in DSM113-S medium at 30°C in the late-exponential phase. The major cellular fatty acids of strain AST-10T were C14:0 (4.8%), C16:0 (32.8%), 2-OH C16:0 (9.5%), C16:1 (14.6%), C18:0 (16.9%), and C18:1 (19.2%). This composition was generally similar to those of S. paralvinellae GO25T and S. autotrophica OK10T. However, 2-OH C16:0 was a unique fatty acid, differentiating AST-10T from other species within the genus of Sulfurimonas. The strain was selected for genome sequencing on the basis of its 16S rRNA gene-based phylogenetic position within the genus Sulfurimonas (Table 1). It is the first sequenced genome of Sulfurimonas hongkongensis sp. nov. A summary of the genome sequencing project information is shown in Table 2. The genome consists of 28 contigs, which has been deposited at DDBJ/EMBL/GenBank under accession number AUPZ00000000. The version described in the present study is the first version. As described above, the strain was grown in DSM113-S medium under anoxic condition with optimal growth at 30°C, pH7.0-7.5, and NaCl 30 g L−1. The genomic DNA used for shotgun sequencing was prepared by DSMZ. The genome shotgun sequencing project was finished by BGI (Beijing Genomics Institute). Briefly, DNA was first mechanically fragmented with an enrichment size of ∼500 bp. Then the DNA fragmentation was gel purified and quality checked. The recycled DNA was used for shotgun library construction, which was finally sequenced on an Illumina HiSeq 2000 platform using the paired-end 150 bp sequencing strategy. A total of 6,932,096,700 bp of raw sequence was obtained, which was assembled with CLC Genomics Workbench 6.0.2 using a word size of 40 bp. The draft genome was finally assembled into 28 contigs with a 2,302,023 bp genome size and more than 3,000 fold genome coverage (Table 3). aThe total is based on either the size of the genome in base pairs or the total number of protein coding genes in the annotated genome, bAlso includes 54 pseudogenes and 5 other genes. The draft genome was annotated by NCBI Prokaryotic Genome Annotation Pipeline (PGAP). Protein-coding genes with function prediction were calculated based on the PGAP result. The COGs (Clusters of Orthologous Groups) functional annotation was conducted by PRSBLAST search against COGs database with an E-value cutoff 1e-10 [22,23]. Pfam domains were annotated using HMMER 3.0 program on Pfam database with an E-value cutoff 1e-10 [24,25]. SignalP 4.1 Server was employed to analyze proteins with signal peptide . TMHMM Server 2.0 was used to predict transmembrane helices in proteins . The draft genome of Sulfurimonas hongkongensis AST-10T was assembled into 28 contigs with a total size of 2,302,023 bp and a GC content of 34.9%. 2,332 genes were annotated, 2,290 of which were protein-coding genes. The remaining 42 genes were RNA genes including 3 rRNA genes. A total of 1,146 of the protein-coding genes were assigned putative functions. The remaining 1,144 protein-coding genes were annotated as hypothetical proteins. The AST-10T genome properties and statistics are summarized in Tables 2–4 and Figure 3. 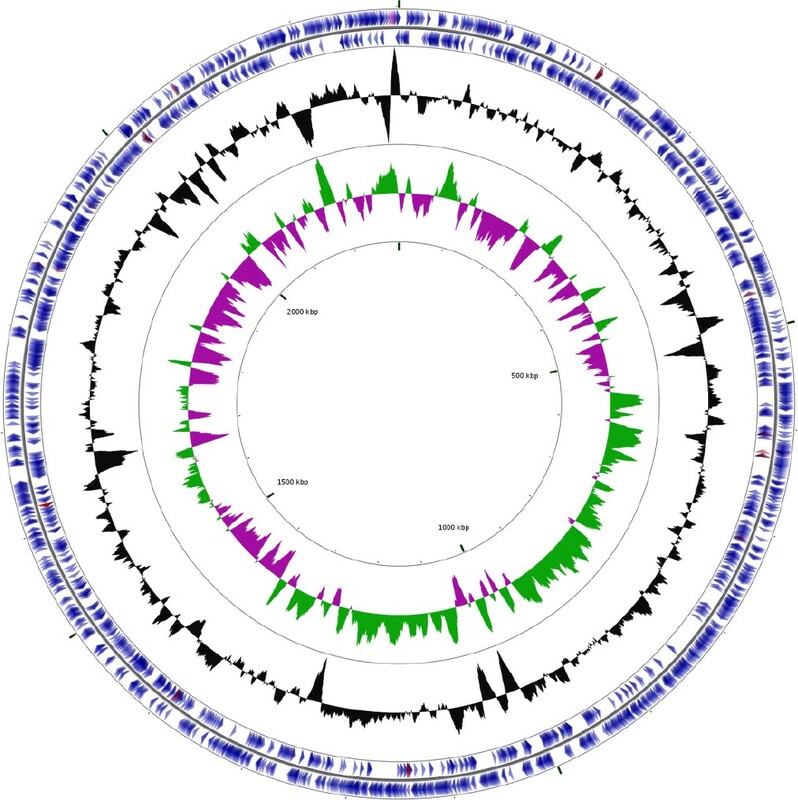 Graphical circular map of the Sulfurimonas hongkongensis AST-10 genome. Seen from the outside to the inside: genes on forward strand, genes on reverse strand, GC content, GC skew. The graphical map was plotted on the CGview Server. Description of Sulfurimonas hongkongensis sp. nov.
Sulfurimonas hongkongensis (hong.kong.en’sis. N.L. fem. adj. hongkongensis pertaining to Hong Kong, the city where the type strain was isolated). Strain AST-10T is rod-shaped with size of 0.2–0.4 µm × 0.5–1.2 µm. It is an obligate anaerobe and occurs singly. The temperature range for growth is 15–35°C, optimum at 30°C. The pH range for growth is 6.5–8.5, optimum at 7.0–7.5. The salinity range for growth is 10–60 g L−1, and optimum at 30 g L−1. Strictly chemolithoautotrophic growth occurs with H2, HS− or S2O32− as an electron donor and with nitrate as an electron acceptor. Nitrate is reduced to N2, and reduced sulfur compounds are oxidized into S0 or SO42− (depending on molar ratio of S2O32−/NO3−). The major cellular fatty acids are C14:0, C16:0, 2-OH C16:0, C16:1, C18:0, and C18:1, with C16:0 2-OH as a unique fatty acid different from other species in the genus Sulfurimonas. The type strain AST-10T = DSM 2096T = JCM 18418T, was isolated from coastal sediment at the Kai Tak Approach Channel connected to Victoria Harbour in Hong Kong, China. The GC content of the genome is 34.9%. The genome sequence has been deposited at DDBJ/EMBL/GenBank under accession number AUPZ00000000. Dr. Lin Cai thanks The University of Hong Kong for the Postdoctoral Fellowship. This study was financially supported by the Research Grants Council of Hong Kong (HKU7201/11E).